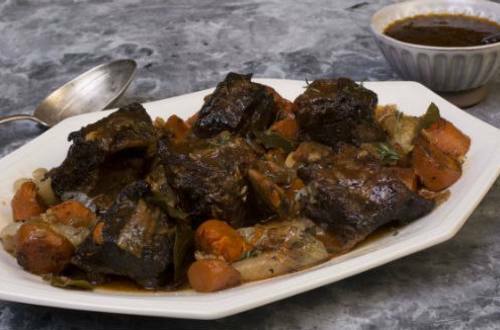 There’s nothing quite like the amazingly savory slow-cooked flavor of braised short ribs with gravy. Baked for 2 hours and seasoned with thyme, bay leaves and garlic, this dish gives you that sought-after fall-off-the-bone tenderness. 1 Preheat oven to 325°. 2 Heat 2 tablespoons olive oil in large skillet over medium-high heat and brown short ribs on all sides. Remove short ribs to plate. Deglaze pan with a little water, then add to large heavy-duty oven-proof pot with lid. 3 Heat remaining 1 tablespoon olive oil in another skillet over low heat and cook onion and garlic to caramelize. Stir into pot with deglazing liquid. Stir in Knorr® Homestyle Stock - Beef and water. Bring to a boil over high heat. Stir in ribs, thyme and bay leaves. Cover tightly with aluminum foil, then cover with pot lid. Bake covered 2 hours. Add carrots and bake until ribs and carrots are tender, about 30 minutes. 4 Meanwhile, brown cipollini onions in remaining 2 tablespoons olive oil over medium heat in another skillet; set aside. 5 Remove ribs to serving dish and keep warm; skim fat from stock. Whisk in cornstarch blended with 1/4 cup water. Bring stock to a boil and continue boiling over medium heat until slightly thickened, about 5 minutes. Pour gravy over ribs to serve. Garnish with caramelized cipollini onions and, if desired, additional fresh thyme.